The hair-raising cliffside road D952 above the Verdon River in the Gorges du Verdon, Parc Naturel Regional du Verdon in Provence, France in Europe. 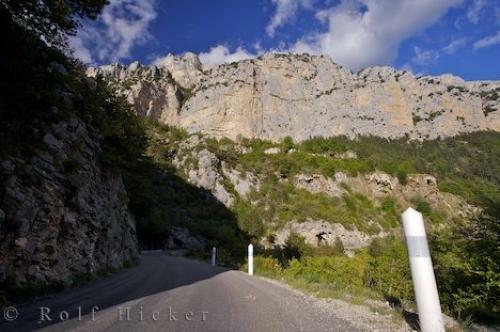 Photo of the D952 cliffside road along the Gorges du Verdon in the Parc Naturel Regional du Verdon in Provence, France. ... The road, D952, along the Grand Canyon du Verdon, Gorges du Verdon, Parc Naturel Regional du Verdon, Alpes de Haute, Provence, France, Europe. I photographed this photo with the digital SLR camera model Canon EOS-1Ds Mark II, aperture of f/8.0, exposure time of 1/100 sec. on ISO 100, as always I used a original Canon Lens, the focus lenght for this picture was 16mm.